ARLINGTON, VA; September 14, 2015 – PBS today announced plans to broadcast AMERICA AFTER CHARLESTON, a one-hour town hall meeting that aims to explore the many issues propelled into public discourse after a white gunman shot and killed nine African-American parishioners in Charleston’s Emanuel African Methodist Episcopal Church in June 2015. Gwen Ifill, PBS NEWSHOUR co-anchor and managing editor, and moderator and managing editor of WASHINGTON WEEK, will moderate the special broadcast. AMERICA AFTER CHARLESTON, produced for PBS by WETA Washington, DC, WGBH Boston and South Carolina ETV Network, with funds provided by PBS and the Corporation for Public Broadcasting, will air Monday, September 21, 2015, 9:00-10:00 p.m. ET on PBS (check local listings). The events in Charleston have sparked national conversations about the meaning and significance of the Confederate flag, put new focus on the political call to action, “Black Lives Matter,” and has made race and the changing demographic landscape a central topic in the 2016 elections. Through conversations with the families of the victims, Charleston civic leaders and commentators from across the country, this town hall special brings together a diverse range of voices to engage in constructive conversation about the issues raised by the events in South Carolina. AMERICA AFTER CHARLESTON will be taped just blocks from the site of the shootings, at the Circular Congregational Church before a live audience on Saturday, September 19. The special will engage audiences across digital platforms through exclusive web content, live social media integration during the broadcast and educational resources that will be made available to teachers and students. The special airs one year after Ifill served as moderator for AMERICA AFTER FERGUSON, a national conversation, broadcast on PBS in September 2014, which explored the complex questions raised around race, class and identity in the wake of Michael Brown’s death in Ferguson, Missouri. PBS LearningMedia, an online library with thousands of digital resources for K-12 teachers and students, will make digital assets from the show available to teachers and students. The additional material will complement a wide range of other content addressing gun violence and racism from other PBS programs such as Not in Our Town, A Path to Violence, After Newtown and U.S. Gun Homicides: Visualizing the Numbers. AMERICA AFTER CHARLESTON is a multi-platform initiative with diverse digital and social media integration. To help foster a national dialogue, PBS and its member stations will incorporate live tweets during the broadcast. 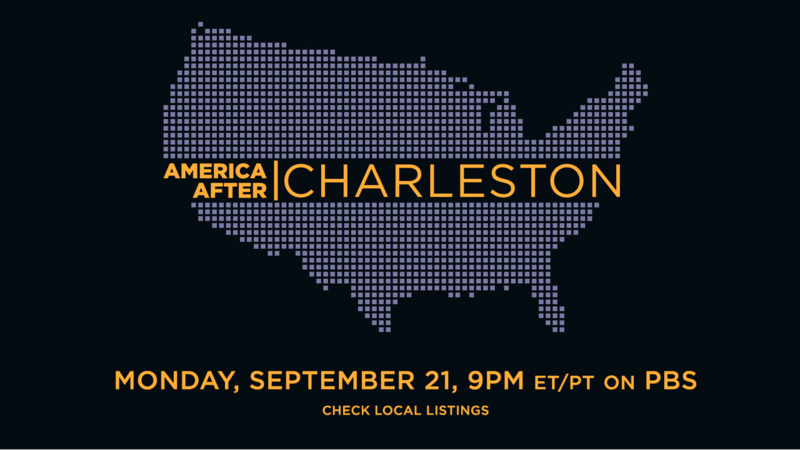 Viewers are encouraged to engage in the conversation using the hashtag #AfterCharlestonPBS. Credentialed media wishing to cover the event must RSVP to Kate Kelly (WETA; kkelly@weta.org) by Thursday September 17, 2015. Full audio and video of AMERICA AFTER CHARLESTON will be embargoed until after its broadcast on PBS on September 21, and select portions will be sourced out by PBS and PBS NEWSHOUR prior to its broadcast. PBS NEWSHOUR is seen by over four million weekly viewers and is also available online, via public radio in select markets, and via podcast. PBS NEWSHOUR is a production of NewsHour Productions LLC, a wholly-owned non-profit subsidiary of WETA Washington, DC, in association with WNET in New York. Major funding for PBS NEWSHOUR is provided by the Corporation for Public Broadcasting, PBS and public television viewers. Major corporate funding is provided by BNSF, with additional support from the Alfred P. Sloan Foundation, Carnegie Corporation of New York, the J. Paul Getty Trust, the John D. and Catherine T. MacArthur Foundation, the Lemelson Foundation, National Science Foundation, The Rockefeller Foundation, the William and Flora Hewlett Foundation, Ford Foundation, Skoll Foundation, Friends of the NewsHour and others. More information on PBS NEWSHOUR is available at www.pbs.org/newshour. On social media, visit NewsHour on Facebook or follow @NewsHour on Twitter. WETA Washington, DC, is one of the largest-producing stations of new content for public television and serves Virginia, Maryland and the District of Columbia with educational initiatives and with high-quality programming on four digital television channels. Other WETA productions and co-productions include PBS NEWSHOUR, WASHINGTON WEEK WITH GWEN IFILL, THE KENNEDY CENTER MARK TWAIN PRIZE and documentaries by filmmaker Ken Burns, including THE ROOSEVELTS: AN INTIMATE HISTORY and more recently, KEN BURNS PRESENTS CANCER: THE EMPEROR OF ALL MALADIES A FILM BY BARAK GOODMAN. Sharon Percy Rockefeller is president and CEO of WETA. More information on WETA and its programs and services is available at weta.org. WGBH Boston is one of America’s preeminent public broadcasters and producer of PBS content for TV and the Web, including FRONTLINE, NOVA, AMERICAN EXPERIENCE, MASTERPIECE, ANTIQUES ROADSHOW, ARTHUR, CURIOUS GEORGE and other primetime, lifestyle and children’s series. WGBH is a major supplier of public radio programming and oversees Public Radio International (PRI). A leader in educational multimedia for the classroom, WGBH supplies content to PBS LearningMedia, a national service for teachers and students. WGBH also is a pioneer in technologies and services that make media accessible. More info at www.wgbh.org. South Carolina ETV is the state’s public educational broadcasting network. Using television, radio and the web, SCETV’s mission is to enrich lives by educating children, informing and connecting citizens, celebrating our culture and environment and instilling the joy of learning. South Carolina ETV currently presents A CHEF’S LIFE, 180 DAYS: HARTSVILLE, JOURNEY TO PLANET EARTH, EXPEDITIONS and FOR YOUR HOME on public television in addition to national radio productions SONG TRAVELS, PIANO JAZZ, CHAMBER MUSIC FROM SPOLETO FESTIVAL USA and WORLD OF OPERA. More information is available at www.scetv.org.